Central FC kicked off its 2013/14 Digicel Pro League campaign in style tonight as the “Couva Sharks” recovered from a one-goal deficit to stun defending champions Defence Force 3-1 at the Ato Boldon Stadium in Couva. There was as much action off the field as on it with over 2,000 spectators in attendance for the Pro League opener. By the second fixture of the double header, it was clear who the majority of the spectators had come to see. 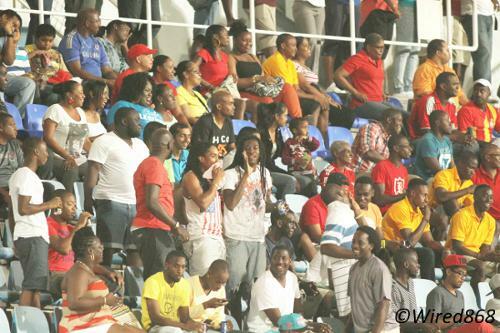 Photo: There were over 2,000 football fans for the Pro League opener at the Ato Boldon Stadium in Couva. Point Fortin Civic Football Club brought colour, noise and more than a few supporters to the Pro League as the team from deep south marked its return to the top flight with an emphatic 4-1 mauling of Police FC. New National Security Minister Gary Griffith knows a thing or two about sport as a former domestic hockey player. He should look into his servicemen’s football team. Defence Force was outgunned on the night but coach Ross Russell would get it right on another day as the army/coast guard unit added to the spectacle with a decent performance. But Police was shambolic. Barely five players had numbers on their back at the kick off while, as the host team, Police also did not show up with a full complement of ball boys. In short, it was not the sort of order one should expect from the country’s protective services. 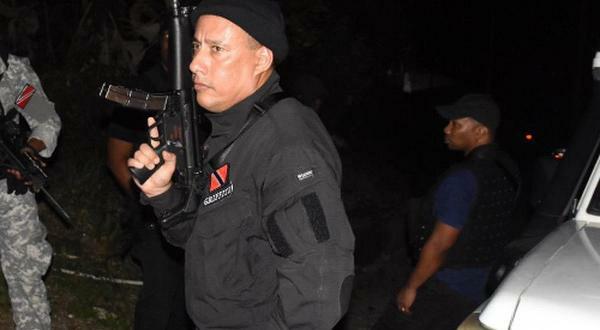 Point Fortin gave the lawmen the scant respect that they deserved on the night. 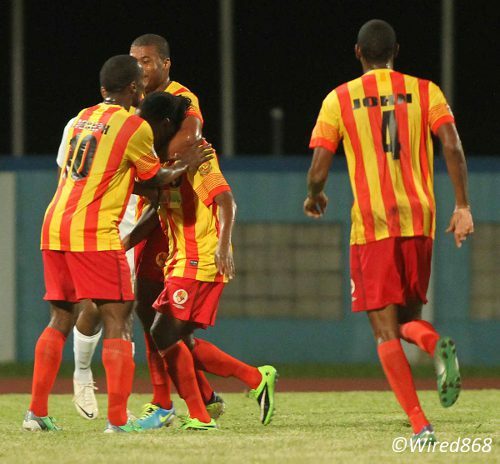 Photo: Point Fortin Civic FC celebrates its first Pro League goal against Police FC in Couva. Andre Toussaint, who represented Caledonia AIA in the ongoing 2013 CONCACAF Champions League competition, put Point Fortin ahead after 15 minutes with a close range finish after Matthew Bartholomew kept a deep Marcus Joseph cross alive at the far post. And Joseph, who represented Trinidad and Tobago in the recent OSN Cup in Saudi Arabia, doubled the lead in the 36th minute as his powerful angled effort took a deflection to embarrass Police custodian Adrian Foncette at his near post. Bartholomew got the third in the 38th minute as he opened his body to produce a smart left footed finish in the far corner after being sent clear by Toussaint. 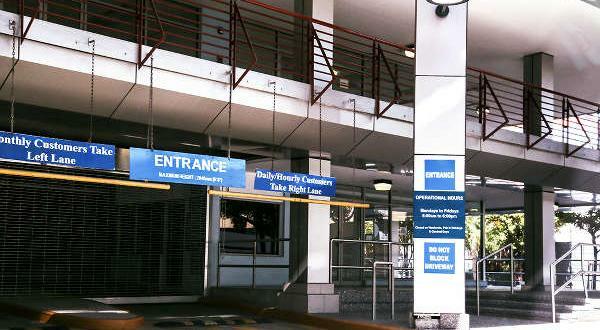 Police captain Todd Ryan offered the “Lawmen” a lifeline with a tidy header in the 64th minute off a Akiba Peters free kick. 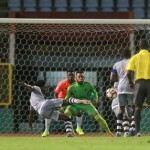 But Bartholomew had the last word in the 85th minute from the penalty spot after referee Larry Lalchan ruled that Police defender Karlon Murray had fouled Point Fortin substitute Sylvester Teesdale. In the opener at Couva, Defence Force winger Kerry Joseph cut in from the right flank to head an inswinging Kevon Carter cross past Central and “Soca Warriors” custodian Jan-Michael Williams. Referee Gyasi McDonald could take credit for the first goal of the season as he allowed play to continue after Central wing back Elton John tripped opposing midfielder Samuel Delice, just before Carter’s cross. Photo: Defence Force stopper Rodell Elcock (centre) towers over Central FC striker Dwight Quintero to win a header. The match officials did the fixture justice again in the 27th minute as Defence Force captain and full back Cory Rivers was correctly penalised for handling a John cross. Central captain Jason Marcano coolly converted the resulting penalty kick to bring the Sharks level at 1-1. But the eventual outcome of the match owed almost as much to McDonald’s generosity in the second half as it did to two brilliant strikes by Central’s teenaged strike force. 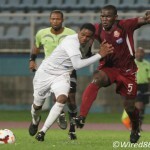 In the 53rd minute, Jamal Jack, Central’s pre-season signing from St Ann’s Rangers, went in two-footed on Sean Narcis. Jack got the ball but it was a dangerous tackle and McDonald correctly signalled a foul. The referee could have easily taken firmer action though and Jack had already been booked. Photo: Defence Force forward Richard Roy (centre) tries to burst past Central FC defenders Keion Goodridge (left) and Akeem Benjamin. Central made the most of the reprieve in the 67th minute when 19-year-old recruit Dwight Quintero marked his debut with a precise left footed drive into the far corner from 20 yards. 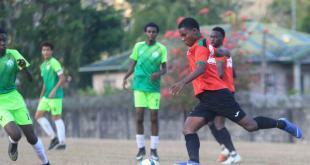 It capped a promising outing for the former national under-20 striker who spent the last two seasons in the North East Stars’ reserve team. Central was again lucky to keep all eleven players on the field in the 75th minute as ex-W Connection defender Akeem Benjamin, who was already cautioned, hauled back Defence Force striker Richard Roy in front of McDonald. Benjamin received a verbal warning rather than a second yellow card. Five minutes later, Defence Force coach Ross Russell was hopping around in frustration at the touchline as Central defender Keion Goodridge clumsily bundled over Rodell Elcock in the penalty box. McDonald was conspicuous by his silence. 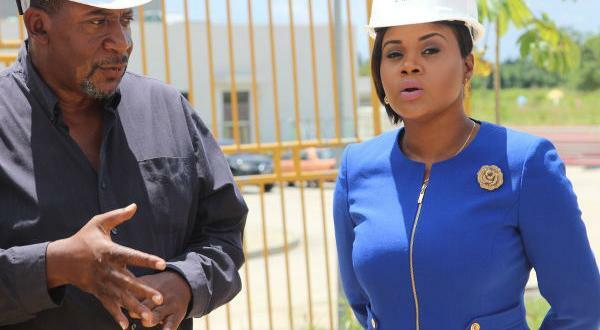 And, in the 81st minute, Rundell Winchester rubbed salt in the army’s wounds with a brilliant insurance item that brought the venue to its feet. Photo: Central FC strikers Dwight Quintero (second from left) and Rundell Winchester (second from right) share the love while Akeem Benjamin (far left) and Jason Marcano join in. Graham missed a right side Central cross but managed to divert the flight of the ball behind Winchester. Not to be denied, the former Stokely Vale poacher spun around and met the bouncing ball with an overhead kick that flew in off the underside of the bar. 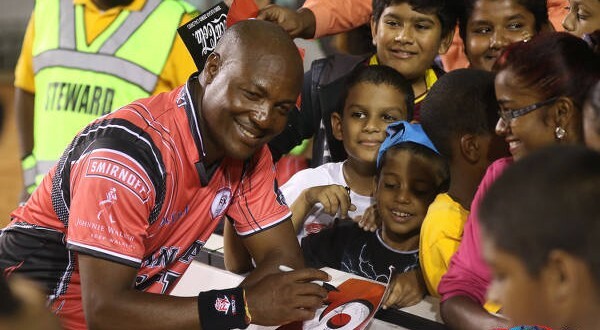 Tomorrow’s Pro League double header at Port of Spain’s Hasely Crawford has a lot to live up to. Defence Force (4-2-3-1): 1.Kevin Graham (GK); 4.Marvin Jones, 5.Devin Jordan, 20.Rodell Elcock, 14.Cory Rivers (captain); 18.Sean Narcis, 32.Samuel Delice (8.Curtis Gonzales 54); 16.Kerry Joseph (29.Jemel Sebro 71), 17.Ross Russell Jr, 11.Kevon Carter; 9.Richard Roy. Unused substitutes: 25.Sheldon Clarke (GK), 12.Josimar Belgrave, 81.Adrian Welch, 34.Levi Serries. Central FC (3-5-2): 21.Jan-Michael Williams (GK); 12.Jamal Jack, 24.Akeem Benjamin, 3.Keion Goodridge; 2.Elton John, 7.Jason Marcano (captain), 10.Marvin Oliver (6.Toric Robinson 74), 13.Johan Peltier, 11.Darren Mitchell; 9.Dwight Quintero (22.Keon Trim 87), 17.Rundell Winchester (23.Hector Sam 90). Unused substitutes: 25.Javon Sample (GK); 4.Omar Charles, 8.Shem Alexander, 15.Kaydion Gabriel. Good start Point! Looks like the rest of us have to catch up with you when it comes to fan support. If you travelled that large, I can only imagine when we come to Mahaica. Great for football great!!! if only the cameras could shoot from the other side to show the support you had, things can only get better.